It is one of the most alluring sights for any visitor to Moscow: the first glimpse of the spectacularly colourful St Basil's Cathedral across the vast expanse of Red Square. For many foreigners it is the ultimate symbol of everything Russian. The cathedral's exotic spires and domes are so enchanting that legend has it that Ivan the Terrible gouged out the eyes of its architect, Posnik Yakovlev, so he could never build anything as beautiful again. He was not the only one denied the chance to have a good look at the 16th-century masterpiece. In early September, Moscow suffered its worst smog in 30 years. With visibility reduced to 50 metres, bewildered tourists stumbling around Red Square with streaming eyes and sore throats almost had to fall on top of St Basil's before they could make it out. Forest and peat fires raged around Moscow throughout August, an exceptionally hot month, with no rain to disperse the smoke. The situation got so bad that doctors suggested that people stay inside if possible. Prosecutors launched an official probe into local officials' negligence, as carbon monoxide levels grew increasingly toxic. But the spirit of enterprise in modern Moscow is growing and in the same damn-it-I'll-drive-on-the-footpath mentality that enables locals to defeat colossal traffic jams, officials decided they wouldn't let anything as trivial as broad-ranging meteorological conditions get in their way. They devised a cunning plan. 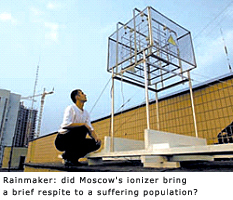 The emergency situations ministry set up an ionizer on the roof of its building in western Moscow to create artificial rainclouds over the city. The apparatus was supposed to emit oxygen ions to raise humidity. Sure enough, on Friday September 6, Muscovites going to work in air that smelt and tasted as if bonfires were blazing were blessed with a few hours' light rain. "We did it," boasted ministry spokesman Viktor Beltsov. It may have given locals a few hours' breathing space, but many were sceptical that the ministry had induced the brief shower and managed to defy weather forecasts. An ionizer of the size used would have been hard pressed to humidify enough air to bring rainclouds to a city of 994 square kilometres. The ministry predicted that the ionizer would deliver yet more rain. However, the smog reached a peak the following Sunday, with carbon monoxide levels in some parts of the city at 2.7 times the maximum allowed. The government may not have won the PR battle on this occasion, but then the City of Moscow has not had much more luck convincing Muscovites of the validity of any of its strategies. According to a recent poll, some 80% think the municipal government has a bad economic track record, when in fact, Moscow has been one of the main beneficiaries of economic reform in Russia. Its contribution to federal GDP is steadily growing. It is home to 90% of Russia's financial services businesses. Retail and wholesale trade and new private companies are fast emerging. About half the companies with foreign investment are also Moscow-based. So Moscow's officials aren't pleased about the kidnapping of Sergei Kukura, vice-president and chief financial officer of Russia's biggest oil company, LUKoil. Kukura was seized by masked men armed with automatic rifles as he was being driven to work in the city on September 12. Although most analysts consider this to be an isolated incident, Kukura is believed to be the highest-ranking businessman to be abducted since Russia began its market reforms. It's not good news for a city that has fought to dispel the reputation for kidnappings and contract killings that dogged it in the early 1990s. City police say they do not expect to solve the case quickly. Complications include the fact that Kukura's employer has not yet agreed to pay more than $1 million of the $6 million ransom demanded by his captors and that the kidnappers' car was said to bear the blue licence plates of Russia's interior ministry, the federal law enforcement agency. By comparison with this imbroglio, the smog is likely to rank as one of the city's lesser publicity problems and one that will be more rapidly forgotten.